You know it’s coming: snow, cold, wind and ice. Winter. But before it gets here, there are some things you should do to help you save money and stay safe and comfortable when the snow flies. Heating system. Have your furnace inspected by a licensed heating contractor, and make any repairs needed. Change your furnace filter, and know how often you need to change it throughout the winter. Ask the heating contractor if you need to have your ductwork cleaned. This also is a good time to consider whether you need to upgrade your furnace or install a programmable thermostat. Windows and doors. Many homes leak cold air through windows and doors. Hold a candle in front of your windows and doors; if the flame flickers, you are letting in cold. Possible fixes can range from window replacement to caulking around windows to plastic insulation. The important thing is to keep your heat in and the cold out. Chimney If you have a fireplace, call a professional to inspect and clean your chimney if necessary. Then make sure you have plenty of wood for the winter. Roof and gutters. Once all the leaves are down, clean your gutters or have someone clean them. While you are up there, check your roof for loose shingles or other signs of trouble. 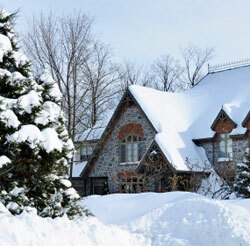 If you have a recurring problem with ice dams, consider installing heat strips to keep ice from forming. Yard work. Mow your lawn one final time, and fertilize if necessary. Move delicate plants indoors, and mulch perennials to provide protection against the cold. Clean and store outdoor furniture, lights, etc. Service your lawnmower for winter. Drain and store your hoses, and turn off the water to outdoor faucets if necessary. Pipes. If you have any water pipes that are exposed to the cold, make sure they are sufficiently insulated to withstand extreme cold. Snow removal. Service your snowblower, and move your snow shovels out of the garage or basement and onto your porch or somewhere else where they are easily accessible. Stock up on salt or other ice-melting products. Your car. Have your car tuned up for winter. Check the tires and make sure they are appropriate for the weather you are likely to encounter. Put an emergency kit in the trunk if you travel any distance in the winter. Emergency readiness. Be prepared in case a blizzard leaves you stranded and without power. Stock your pantry with canned goods and other staples. Locate or buy battery-powered lanterns and candles. Think about ways you could stay warm if you lost power, and prepare for that eventuality. Stock up on necessities such as toilet paper, bottled water, diapers, basic first aid supplies and prescription drugs. Have a battery-powered radio – and extra batteries. Then, settle back, light the fireplace – and let it snow, let it snow, let it snow.